Ask your students to describe what differences exist between manually adding binary numbers and manually adding decimal numbers, if any. Begin the design process by drawing a truth table for the circuit, then determining the necessary gate circuitry to fulfill each output function. Why is this circuit referred to as a half adder? How would a full adder circuit differ from this? Have your students explain their design process to you, step by step. This circuit diagram is easy enough to discover in the pages of a textbook, so don't be surprised if students simply copy what they see without trying to understand how it works! Begin the design process by drawing a truth table for the circuit, writing a boolean SOP expression for each output, then determining the necessary gate circuitry to fulfill each output function. Deriving the two cascaded Ex-OR gates from the boolean expression is a bit tricky, but not impossible. Remind your students if necessary that the boolean equivalent for the Ex-OR function is [`A]B + A[`B], and that the Ex-NOR function is AB +[`A] [`B]. 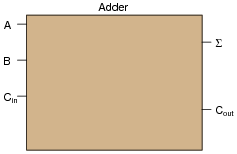 Explain the difference between a ripple adder and a look-ahead adder. What does the term "ripple" mean in this context? Why is "ripple" potentially a bad thing for a digital adder circuit? "Ripple" adders update their output bits one at a time rather than simultaneously. This leads to false, transient output states. The "ripple" effect seen in simple binary adder circuits is not limited to adders! 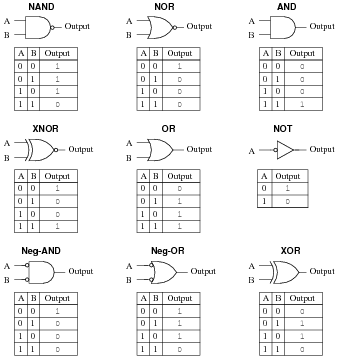 Some Gray-to-binary code converters and counter circuits also exhibit ripple, with the same deleterious effects. These two circuits perform the same mathematical function, yet the manners in which they perform this function are quite different. 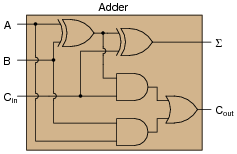 Compare and contrast the digital adder and the analog summer circuits shown here, citing any advantages or disadvantages of each. This question is not really specific to adder/summer circuits, as it may first appear. The fundamental comparison being drawn in this question is between digital and analog. This is an important concept for students to grasp, as both have their roles in modern electronics. A common fallacy is that "digital is better" in all circumstances, but the truth is that both digital and analog have their respective strengths and limitations. 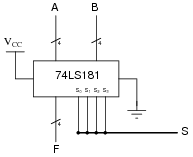 Explain the purpose of a magnitude comparator IC such as the 74LS85. What function, or functions, does it perform? I will let you research the datasheet for a magnitude comparator on your own to discover the answer(s)! Be sure to ask students where they obtained their information. It is very easy to obtain datasheets online (over the internet), making it convenient to assign short research projects such as this. Research the datasheet of an integrated arithmetic logic unit such as the 74AS181, and determine how its various modes of operation (addition, subtraction, comparison) are selected. This is a small research project I leave up to you! Be sure to bring a copy of your IC datasheet to class for discussion! Follow-up question: an interesting feature of the 74AS181 is that it provides ärithmetic" functions as well as "logic" functions. These two modes could also be referred to as "binary" and "boolean," respectively. Explain what distinguishes these two operating modes from one another, and why they are classified differently. Although the 74181 ALU is a somewhat dated IC (in fact, some versions are obsolete as of this writing - 2005), it stands as a simple example for students to learn from. A circuit such as this provides a good example of the power of integration, as opposed to constructing a similar logic function from individual gates (not to mention discrete transistors!). The follow-up question brings up a point many students are confused on: the distinction between binary (numerical) and boolean (bitwise) operations. Binary is a place-weighted numeration system, used to symbolize real numbers using only two states per place. 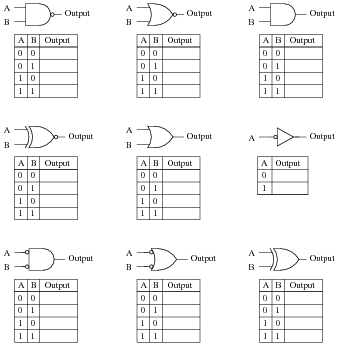 Boolean is a number system characterized by having only two possible values. Since both binary and boolean have something to do with two-valued quantities, many students believe the two to be interchangeable terms and concepts. However, they are not, and an investigation of the two operating modes of this ALU highlights the distinction. An arithmetic trick often used when working with the metric system is multiplication-by-ten and division-by-ten via shifting of the decimal point. A similar "trick" may be applied to binary numbers, with similar results. Determine what sort of multiplication or division is accomplished when the "binary point" is shifted in a binary number. Research the datasheet of an arithmetic logic unit (ALU) circuit to see if and how this function is implemented. Shifting the "binary point" results in either multiplication or division by two. A multiplicative shift is performed by the 74AS181 ALU by arithmetic function selection 11002 (C16). Challenge question: explain how multiplication or division by any binary quantity may be accomplished using successive bit-shifts and additions. For example, show what steps you could take to multiply any binary number by five (1012), using only "binary point" shifting and addition(s). A lot of arithmetic tricks existing in the decimal numeration system are applicable, with slight revision, in the binary numeration system as well. This is a popular one, and often used by shrewd computer programmers to execute fast multiply-by-two or divide-by-two operations when "conventional" multiplication commands take more time. Lines A, B, and F (with the slash marks and the number "4") represent four actual conductors, carrying four bits of digital information. The thick line (S) is also a four-bit "bus" but is denoted by a slightly different convention. In case you were wondering, it is unusual to mix two different bus symbol conventions in the same schematic diagram. I show this here only for your benefit, to see that there is more than one ßtandard" way to draw it. The answer pretty much says it all. The fact that the IC is an ALU is quite incidental. Some students may research the part number to get a better understanding of what is going on. That is fine, but my emphasis in this question is the schematic diagram convention(s) for multi-conductor busses.